Under this Program Announcement, SCAQMD will be providing its AB 923 funds for the purchase of new CARB-approved Type C or D electric buses with a gross vehicle weight, GVWR, of over 14,000 lbs. Only public school districts and joint power authorities are eligible to apply under this program. 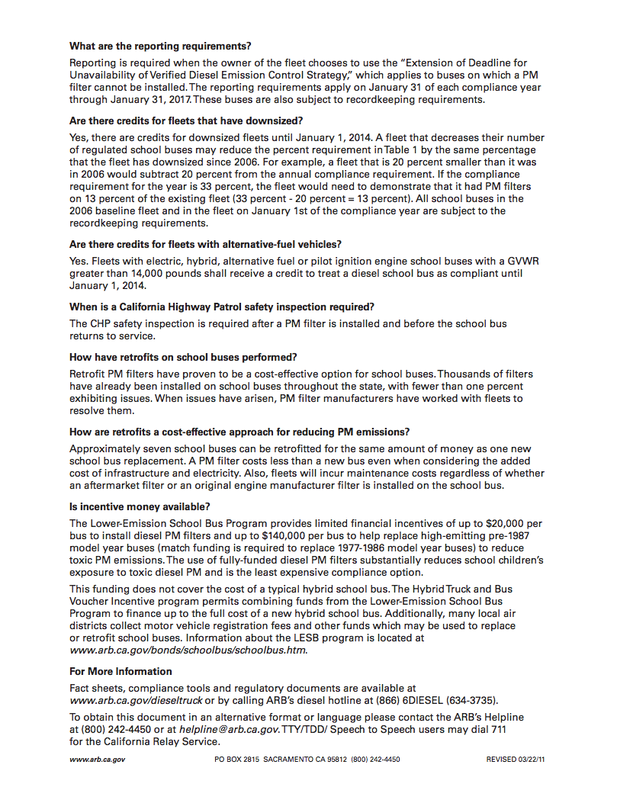 Public school districts are required to apply to CARB's HVIP Program after SCAQMD Board approval of awards on May 5, 2017. If awarded HVIP funds, SCAQMD will fund the remaining balance of the base price of the bus in addition to sales tax. if school districts do not apply and are now awarded HVIP funds, they will be become ineligible for SCAQMD's program and a contract will not be executed. 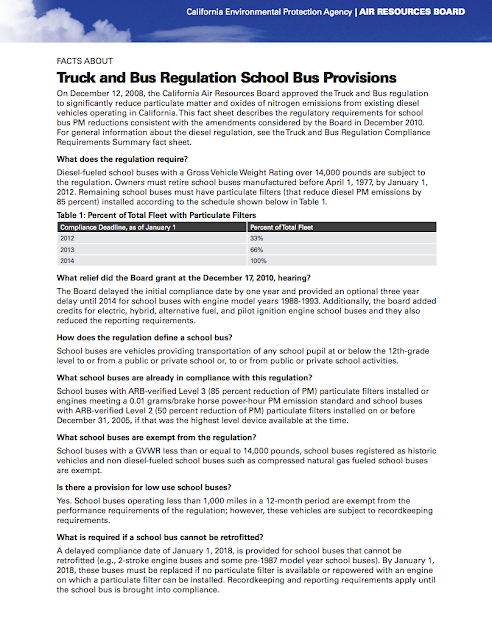 If HVIP funds are awarded, the SCAQMD's program will fund the remaining amount of the full purchase price including sales tax of the electric school bus(es). School districts will have to pay for any additional discretionary options that they may choose to include on the bus. In addition, up to $20,000 per electric school bus will be provided for electric charging infrastructure. On February 7, 2017 Superintendent Vital executed a Grant Application to Purchase 5 Electric School Buses. No Matching Funds are Required - This is totally funded with California Taxpayer dollars. The busses must be purchased from ELion (a Canadian Company) The only approved vendor for this grant money. California Taxpayers are fully funding these expensive busses. CUSD is cutting its bus routes. Parents have to pay for the few bus routes that are remaining. This is a shameful scam on California Taxpayers. Multiply this by thousands of school districts that are being forced to lay off teachers to balance their budget and this is truly a disgrace. CUSD built an $800,000.00 Natural gas fueling station last year which is probably a similar program to this. and now Electric Bus Grants. All of this waste of money while our facilities need $889 million in repairs, we have 8,555 students over capacity, our class sizes are the highest in California and the nation, parents have to fundraise for core educational programs like Art, Music and Science, they have to pay fees for parking and ASB positions. Does this really make financial sense for California students? This is why California Education is in the bottom in the Nation. California is not educating students. California uses our Public Education System to raise tax revenues to spend on new programs and entitlements that are not Constitutionally mandated. This Grant is nothing more than the use of taxpayer money to promote a political agenda of California's radical left CARB Board. CUSD is still the same size. Electric buses have very limited range and capacity. Local money should not be spent on this. The CNG station is a grand experiment that has yet to be proven. This is the same thing. LA airport is trying to put in CNG buses- not working - hours to recharge- maintenance is difficult - very limited range. I recommend that we do not do this. This bus cannot drive across this district and back because of its limited range. The reason to do this is the funding opportunity. We have a mixed fleet. CNG is our only option. Any vehicle 10,000 pounds or greater has to be alternative which is why we went with CNG. The reason we put this grant before you is because we can use them to buy smaller buses for shorter range routes. The Item before is to submit this grant we are not committed to anything. This is the only funding source we to replace large capacity buses outside of our General Fund. The charging station would require $40,000 - $50,000 from General Fund money. So this is not an authorization to buy the buses, it is just approval to apply for the Grant correct? MIS-USE OF TAXPAYER FUNDS? $334,798.00 for ONE electric school bus! CUSD has the attitude that "GRANTS" are free money. It is not, it is taxpayer money. 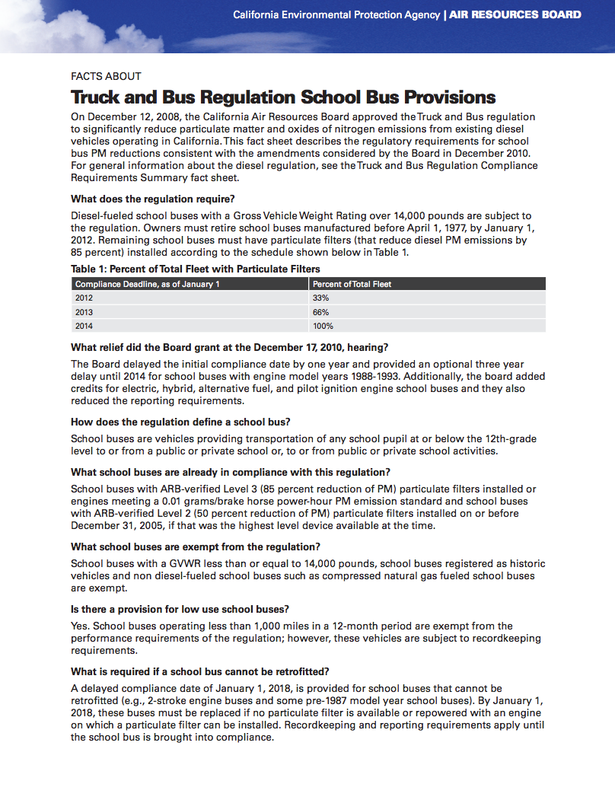 On February 7, 2017 Kristen Vital, WITHOUT BOARD APPROVAL applied for the South Coast Air Quality Management District's Electric School Bus Funding Program. TRUSTEES THOUGHT THEY WERE APPROVING A GRANT APPLICATION WHEN IT FACT THEY WERE AUTHORIZING THE PURCHASE OF 5 eLION ELECTRIC BUSES FROM FIRST PRIORITY BUS SALES. Staff allowed Trustees to believe that this was approval for a "Grant Application". Staff intentionally mislead Trustees. While this is a "GRANT" aka "free money" for CUSD, this is California taxpayer money. When you consider that CUSD students have no art, music or science programs, the largest class sizes in the nation, and aging and facilities that need $889 million in repairs, you have to pause and wonder if this money could be better spent. As one of the requirements to receive the Grant school districts must participate in CARB's Hybrid and Zero Emission Truck and Bus Voucher Incentive Program. TRUSTEES THOUGHT THEY WERE APPROVING CUSD APPLYING FOR A GRANT, WHEN IT FACT THEY WERE AUTHORIZING THE PURCHASE OF 5 ELECTRIC BUSES. CUSD just spent $800,000 on a CNG/natural gas fueling station. The bus drivers at Capistrano Unified School District will save time and district funds by fueling the more than 20 district buses at the newly built compressed natural gas filling station in Aliso Viejo. The $800,000 facility, with 20 filling stations at the CUSD North Transportation Yard at 2B Liberty, was made possible by proceeds from a land sale, said Ryan Burris, district spokesperson. The station is the first of its kind and shows the district’s commitment to energy conservation and a greener environment, he said. On Sept. 13, the district will stage a 2:30 p.m. ribbon-cutting ceremony to celebrate the station’s debut. Amy Hanacek, president of the district board of trustees, and Kirsten Vital, superintendent, are scheduled to speak at the event and to perform the ribbon-cutting.